​It is a great privilege to belong, not only to Christ and His Body, the Catholic Church, but also a to a particular parish, and to be enriched by its blessings. There are both benefits and responsibilities in belonging to a parish, like the Church. "Stewardship" with regard to a parish can be thought of as joyfully and gratefully fulfilling one's responsibilities to the parish and contributing one's gifts for the good of the whole. The gifts that each member of the parish is called to contribute can be in the form of "time", "talent", and/or "treasure." Each parishioner is encouraged to dedicate some time to serving the parish in some capacity. Each parishioner also has unique natural and spiritual gifts that he/she is called to contribute to the good of the whole parish. It is also important that each parishioner play his/her part to contribute financially to the parish, so that the basic activities of the parish may be maintained, and even more, so that the parish may thrive and fulfill its spiritual mission. See the "Service" tab above to survey the different ways you can serve here at St. Dominic Church. See below for more information on financial stewardship. 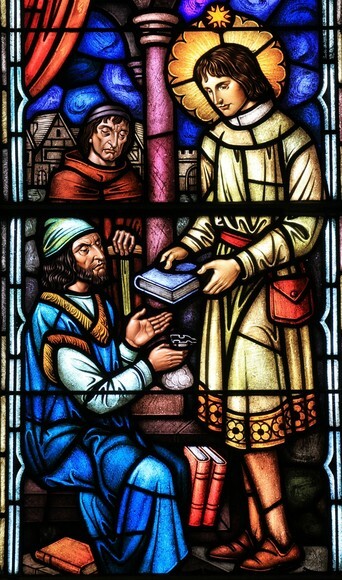 "The fifth precept ('You shall help to provide for the needs of the Church') means that the faithful are obliged to assist with the material needs of the Church, each according to his own ability" (Catechism of the Catholic Church, 2043). We encourage each person to give a percentage of their income versus an amount, and to strive for 5%. If 5% isn't feasible, then one can work down from there to what is feasible, perhaps 4%, or 3 or 2%, etc. One can give through the traditional envelopes at Mass, or electronically through a company called Faith Direct. We encourage all parishioners to sign up for Faith Direct. It is easier for them. It is also greatly beneficial for the parish, as we still get your weekly offering even when you are out of town or when weather conditions make it dangerous or impossible to make it to Mass. See below for how to learn more about or sign up for Faith Direct. It is important for each parishioner to be invested in the parish, and to see it as their own, as their shared spiritual home. The more one invests oneself and sees the parish in this way, the more parishioners will value giving to the parish. We need more parishioners! The more parishioners we have, the less each has to give for the maintenance of the whole. While new parishioners are not sought for financial reasons, if we have many parishioners who spiritually benefit and contribute to the parish, then we should not have to worry about money and making ends meet. In order give through Faith Direct, or in order to find out more information, click the link below, which will take you directly to our parish's webpage within the Faith Direct website. You can also go to the faithdirect.net homepage, click "Give Now," and enter our parish code, which is DC117. Then simply follow the steps. We deeply thank you for contributing to St. Dominic Church, and we hope that you are always spiritually enriched by our unique parish.